I'm having trouble setting up sublime as my git commit message editor. git config --global core.editor "subl"
Error: error: cannot run subl: No such file or directory error: unable to start editor 'subl' Please supply the message using either -m or -F option. git config --global core.editor "/Applications/Sublime\ Text.app/Contents/SharedSupport/bin/subl -n -w"
EDIT: If the name of the app is not Sublime Text.app you will want to replace that with the correct name. This adds a subl alias to /usr/local/bin/ pointing to Sublime Text 3 app’s binary file. Now running subl in Terminal will launch Sublime Text 3 app. This adds editor = subl -n -w to the [core] section of the ~/.gitconfig file. Now running git commit in Terminal will launch Sublime Text 3 app (subl) in a new window (-n), and the command line will wait (-w) until the commit message is saved and closed. git config --global core.editor "'C:/Program Files/Sublime Text 3/subl.exe' -n -w"
editor = "'C:/Program Files/Sublime Text 3/subl.exe' -n -w"
subl -n -w: subl: command not found. even though Sublime works well and can be launched from Terminal. git config --global core.editor " 'XXXXX' -n -w"
while 'XXXXX' is the path which Sublime is launched from. It could be /usr/bin/subl as Pranav Misra mentioned, or /Applications/Sublime\ Text\ 2.app/Contents/SharedSupport/bin/subl, or whatever you put in the symlink you have created. I'm new to the community, and apologize if the answer is not in the proper format. For me the following things worked for Sublime 3 git config --global core.editor " '/usr/bin/subl' -n -w" Thank you all. I tried all of these answers, but nothing worked. ~/.gitconfig showed that sublime was set, but git wouldn't pick up the change. In the end, I restarted my macbook, and that did it. srsly. Not the answer you're looking for? Browse other questions tagged git sublimetext3 or ask your own question. What is this editor opened by “git commit --amend” in Windows 10 cmd and how do I use it? 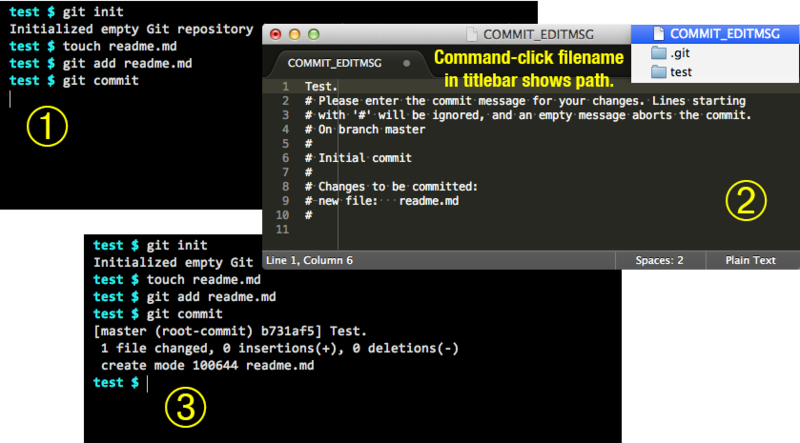 How can I configure git to open the relevant COMMIT_EDITMSG in sublime text 3?